The Global Expatriate's Guide to Investing: Have you thought about your retirement TESOL friends? Gone Seoul Searching reviews "The Global Expatriate's Guide to Investing." 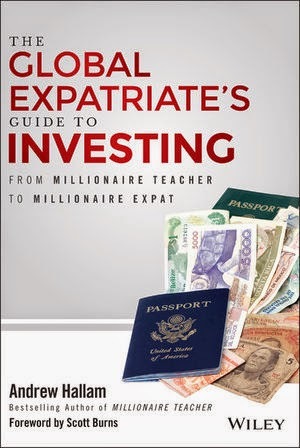 The night I received “The Global Expatriate’s Guide to Investing: from millionaire teacher to millionaire expat” the plan was to read the first 10 pages and fall gently asleep. But instead I was up until 2am, completely engrossed and 130 pages into the book. As I fell asleep that night I was thrilled about my future. For anyone in the TESOL field that is still saving up and blowing it all on expensive vacations or months of traveling during the summer, this book is about to give you a huge wake-up-call. I followed along with Hallam’s basic steps and planned out my retirement fund (Or an initial one at best). At 26 years old, I haven’t thought much about my retirement. I have paid into a few retirement plans in California and have always been a steady saver, though I do not currently have a retirement portfolio. The most valuable lesson that I learned from author Andy Hallam is to start young. Hallam gives concrete formulas and examples for expats to get their retirement kick started. For those that have some knowledge of investment, the book guides you through the basics of choosing a better financial advisor who won’t use up all of your hard earned money with bogus fees and hidden charges. Going with your school’s suggested investment company can often lead you down the black hole of crazy lock in periods with fees that you wish you never agreed to. For those that have little knowledge about where to start, Hallam gives tips for starting a couch potato fund. If you are planning on retiring in the U.S. you can basically walk into any large company like H&R Block and sign up for a mixed portfolio of stocks, bonds, and index funds. He easily explains how any average Joe can get steady returns with low risk—all without an expensive agent. So here is what I planned out during my exciting night of reading. And I am not over exaggerating—I felt SUPER accomplished after finishing half of his book. That leaves me with $57,424 a year to spend. Hallam states that the average retired American spends $31,365. This is what my retirement would look like as an expat with no retirement from the U.S. government or pension from my job. I realize that this is not a perfect estimate, nor may it be achievable. However, now I really know how much money it is going to take for me to plan for my future. I am still in debt paying off my undergraduate and grad school student loans. So I’ve calculated that If I pay off 10,000 in the next year that will be almost comparable to starting my investment funds. So the plan is to get those college loans paid down ASAP and then throw the rest of my money into an investment fund as Hallam suggests. And this is just planning for me. Women always need to be careful; we can never rely on our spouse to figure it out all for us. Who knows, maybe I will never get married or have kids. In that case, I better be prepared. I hope I can stick to my plan and end up a millionaire teacher with millionaire expat Andrew Hallam’s advice. Good luck! Good to see you posting here again! 90 is certainly not too old to imagine. One of my grandmas lived to 90 and the other is going semi-strong at 97. I'm really intrigued with this book. Thanks for sharing. The interest in the books is the best thing that you have to invest your time. Would really like to have one copy for me as well to read and to learn some tips.